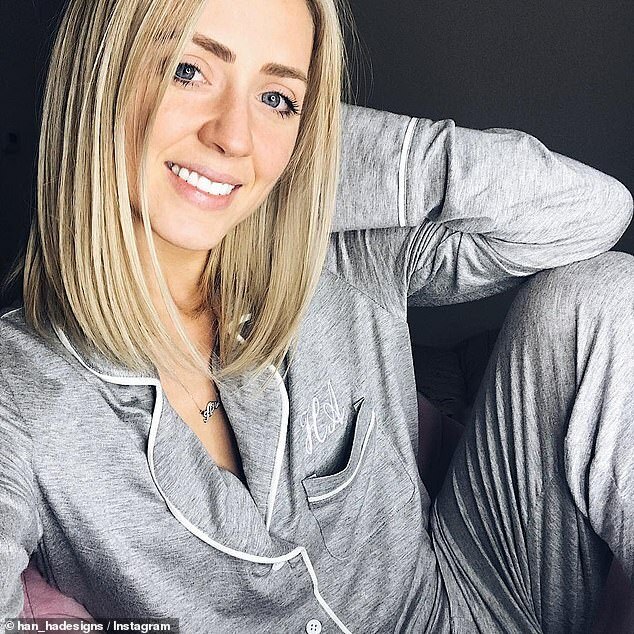 A glamorous WAG and mother-of-two is celebrating after her own brand of personalised gifts, including monogrammed pyjama sets, became a favourite among reality TV queens. 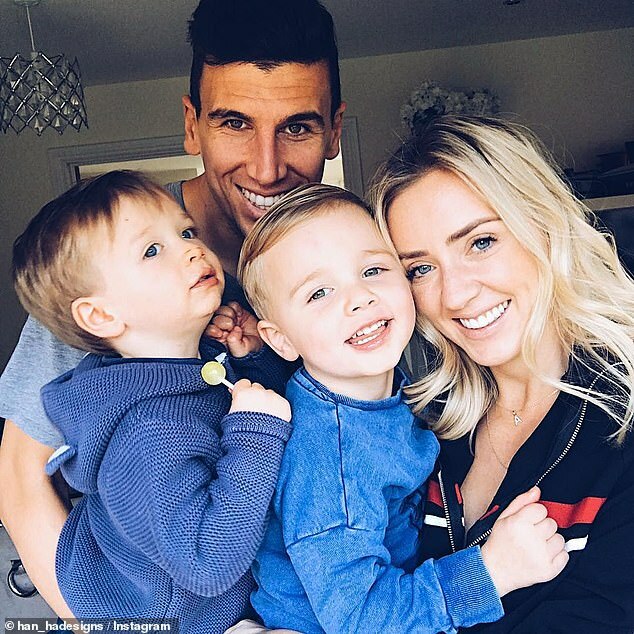 Hannah O’Neill, 28, who is engaged to Middlesborough footballer Daniel Ayala, set up HA Designs in her kitchen whilst pregnant three years ago, in a bid to set a good example to her children by earning her own money. 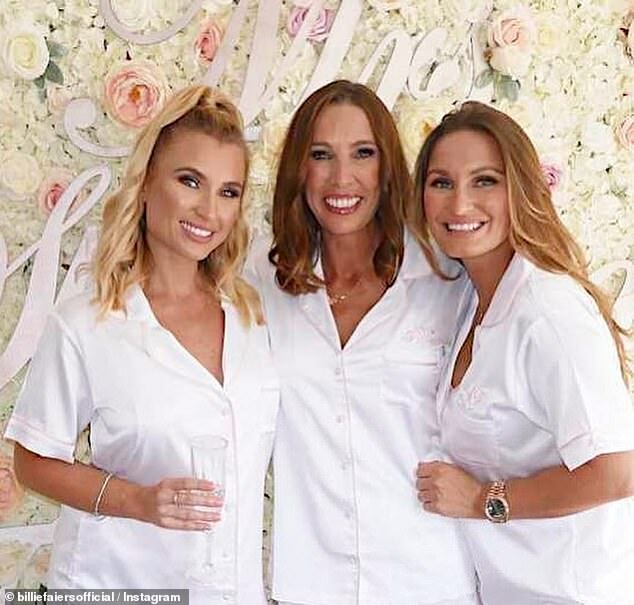 Since then the Hertfordshire-based brand has seen some items sell out in just 24 hours – after being spotted on fans and former TOWIE stars Sam and Billie Faiers, 27 and 28, at Billie’s bridal shower in July – and again on their ITV show this week. ‘The response has been phenomenal. Sam and Billie wore a set for Billie’s bridal shower in July and we sold out in just one day. We re-stocked then had massive sales of that colourway again this week when the party was shown on ITV Be’s Sam and Billie Faiers: The Mummy Diaries this Wednesday,’ Hannah tells FEMAIL. The Essex stars are the latest in a long line of famous faces to step out in the brand’s signature pink, white and grey nightwear, that retails for around £47 a set. ‘It’s amazing to see so many celebrities loving our brand and pyjamas. I have to pinch myself when I see them in them,’ says Hannah. This Morning presenter Rochelle Humes, 29, was seen wearing a dressing gown from the label while bridesmaid at the wedding of her friend and make-up artist Francesca Abrahamovitch in September. And fellow The Saturdays singer Frankie Bridge, 29, and two friends flaunted a pink jersey version of the sleepwear just two days ago. Chloe Lewis, 27, who like Sam and Billie found fame on The Only Way is Essex, opted for her full name on the pocket of her grey jersey set on October 16. Billie’s flower-filled bridal party wasn’t the first time the Faiers sisters had worn one of Hannah’s designs. She also offers leather goods, accessories and bags which the duo showed off on Billie’s Ibiza hen this summer. And it’s not just the celebrity set who are loving Hannah’s pieces – fans who’ve seen them on their favourite TV stars are desperate to snap up their own matching sets. ‘These PJs are soooo cute,’ said one Instagram user in response to Chloe’s snap. ‘Please can we all get matching ones with our names on and have a sleepover party,’ said another, tagging her friends. Speaking about her decision to launch the brand, Hannah, who also counts ex-Made in Chelsea star Stephanie Pratt as a fan, said: ‘After moving to four different cities with my partner’s job I knew I had to start my own business if I wanted to work and still have the flexibility to move within a minute’s notice, which is the reality with football. ‘I love anything personalised so I set out to design affordable goods without compromising on quality,’ she explained. ‘It has all happened very naturally, as I always provide a product that I would be looking for at a price that I couldn’t find elsewhere,’ Hannah added. Entrepreneurial Hannah used her life savings to invest in her first batch of stock – and didn’t use a penny of her man’s money towards her business venture. ‘I remember paying a £500 invoice and I was so scared it would fail,’ she said. Three months after Hannah launched her brand, she had her first child and then fell pregnant unexpectedly three months later. Her business has since gone from strength to strength, with highlights including a pop-up at Topshop’s Oxford Circus flagship, but Hannah says she’s worked hard to get the company where it is now. ‘It was crazy and very hard at times but that is what makes the highs all the more worth it. Money has never been my motivation and I don’t think it should be as you have to work incredibly hard and long hours so you have to love what you’re doing.